This is a great video where Ged talks about how he got into composting, the lessons he has learnt and why he would recommend that you compost. How hard is composting to do? How would you start composting? What resources do I need to begin composting ? What space do I need to compost? What tools & machinery do I need? Do I need a turner to start? Have you owned any other turners? How often do I need to work on the windrow? 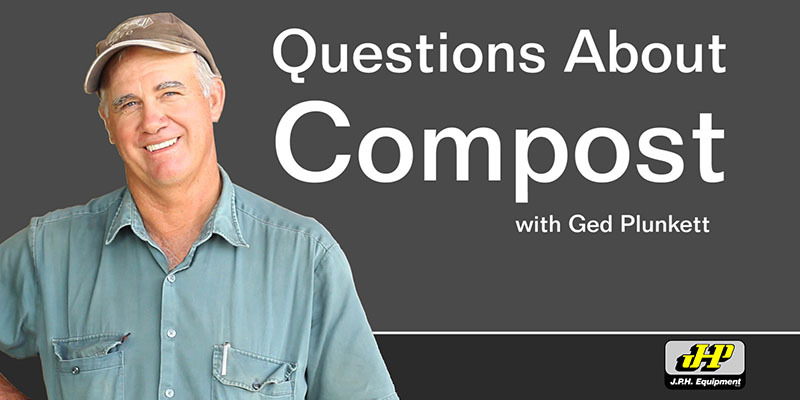 Can you store the compost? Can you sell the compost? As you most likely know Compost is a natural soil improver made from broken-down organic matter, and it contains three things of vital importance to farmers. Humus, that’s the dark spongy material that makes good soil the colour of chocolate, Recycled plant nutrients and most importantly billions of microscopic lifeforms which create a healthy soil ecosystem (Read more about the soil food web). Healthy soil creates healthy plants, which creates healthy humans. And to this end, composting is an important tool. Some of the benefits of compost include: improving drainage and nutrient availability in clay soils. Improveing water and nutrient holding capacity of sandy soils, helping neutralise pH of both acidic and alkaline soils and lstly many toxins are broken down in the composting process, while others such as heavy metals in city soils become locked up and less available to plants when compost is added.